Updated 8:30 All final results posted. 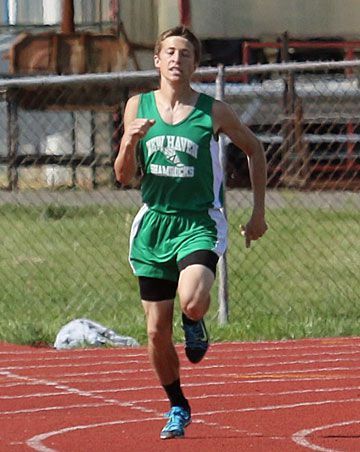 OWENSVILLE, MO - Seth Schenck named Four Rivers Conference Athlete of the year and on the girls side Anna Houston. The varsity girls FRC Champion is Union, Boys Varsity Champion - Owensville, Boys JV FRC Champion - Pacific, and the Girls FRC JV Champions, New Haven. 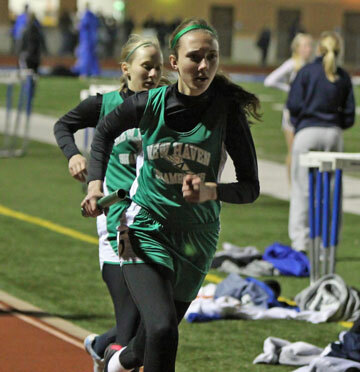 Junior Taylor Covington is one person that Coach Tucker has running four events: 4x400, 4x800, and both the 800 and 400 open races. 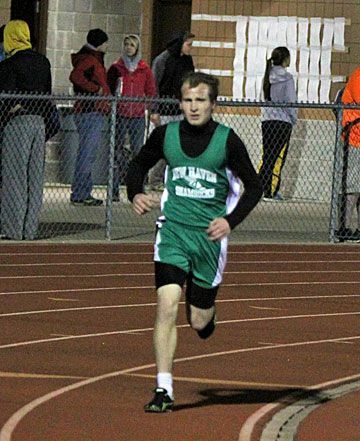 Thus far Covington has placed placed in the top four at each meet and in the top six in the 800. 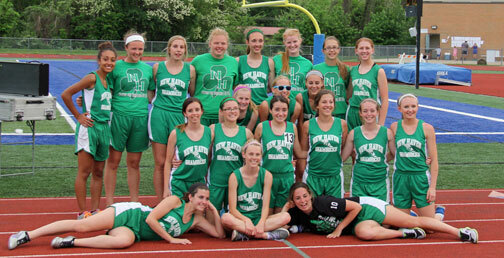 New Haven will wrap up their final regular season in Monday’s Four Rivers Conference Track Meet before entering Districts on Saturday where the girls hope to defend their District Title. Expectations are fairly high for this year’s girls team after breaking the Class 1 state record in the 4x400 last year only to finish second. This year the girls team have improved in field events such as the triple and long with jump as well as individual races, however the team has battled injuries throughout the season, hampering some of their performances. NEW HAVEN, Mo. - The motto of the New Haven School District is "A Tradition of Excellence." In keeping with this tradition, students excel in the classroom as well as in sports. A group of individuals, "The Committee to Build a New Track" made a goal of raising $320,000 to build a new track for the students of NHHS but also for the community. This track will be used by every student that comes through New Haven High School and Middle School and will be available for the community to use as well. The committee has currently raised $200,000 in private donations and thus far has not had any fundraisers until now. 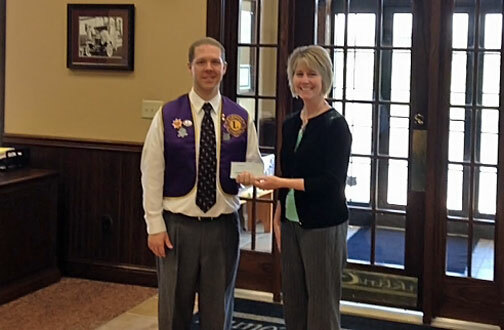 Pictured above is Ryan Winters, Lions Club Treasurer, presenting a check for $1,200 to Angie Scheer, Committee to Build a New Track member. NEW HAVEN, Mo. 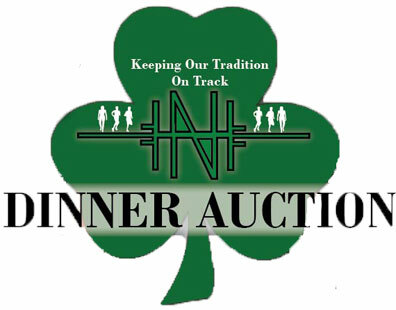 - The Lions Club is donating the entire proceeds from their Annual Pancake Supper held on March 4th to the New Haven Track Project. The New Haven Community Track Project was officially kicked off after committee members held a Town Hall meeting on November 27th, 2013 where a goal of $350,000 was set to be raised over a three year period. 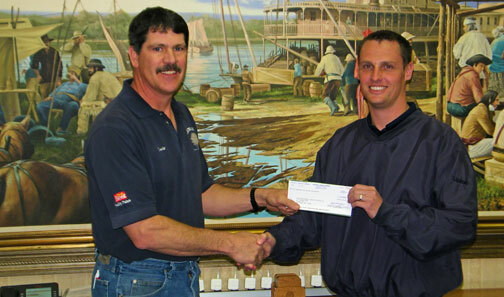 Vice Commander David Shockley (on left) of the Sons of the American Legion presents a $250 (One Meter Level) check to Track Committee Member David Engelbrecht. NEW HAVEN, Mo. 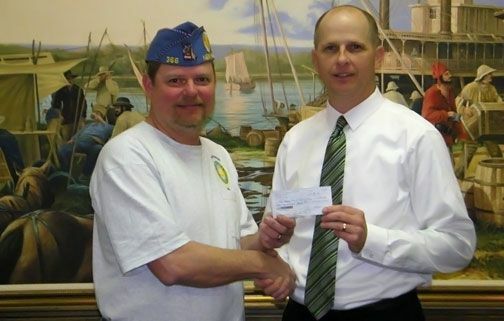 - Wednesday morning David Shockley presented the check on behalf of the Sons of the American Legion, bringing the amount of contributed funds to just under $192,000. NEW HAVEN, Mo. - Earlier this week New Haven Lumber Yard Manager Ernie Swoboda (pictured left) presented a check in the amount of $5,000 to Track Committee Member Brad Zobrist. With the Lumber Yard's gracious donation the amount of contributed funds to the New Haven Community Track Project stands at $190,187.